I'm scared to speak to soon, but if it stays like normal or not tonight feels like my old self. For the whole week now I have enjoyed plenty of time at the gym, running outside, planning my meals and just being on a schedule that works for me. I have missed some crazy things but I didn't realize it until I got them back. I miss feeling sore....I know, its my number 1 complaint that I am sure you get tired of hearing about it but I have missed it. When my body hurts, when I groan to stand up, I feel like I have done something. I have missed coming home and packing up my food and my workout bag for the next day. I have packed one or the other but not knowing if I was going to the gym and not planning before hand has made me less motivated to go to the gym. Now I am packed up and ready to go for tomorrow so no matter what I know what the plan is because I only have one clothing option. By far the cutest part of tonight's workout out fit. The shoes always win the cutest part because the rest of my workout clothes make me look like a homeless person in really tight clothes. I have missed the icing of the joints. Especially since its 85 degrees in my house I am thoroughly enjoying this old favorite. It make that sore knee feel so much better. It feels sooooo good. Soon it will be all taped up and ready to go again. Aside from the habitual things, I just feel like I'm training for something. I think I am losing some of this weight...I really don't know because I haven't weighed. I hope to weigh in the morning but I forgot today. My brain just seems to be back to the way it was about 6 months ago and I am liking the motivation and setting goals and seeing results. Tonight I did get in another workout, another doozie if I say so myself. I thought I was gonna have a workout partner but she had to work late so I was all by my lonesome. I wanted to focus to be on arms and I already had a circuit set up and when I got to the gym the aerobics room was being occupied by 2 people doing the karate class. If there were 30 in there I wouldn't have and issue but there were about 3 people taking up 300 square feet! So I changed my plans and adjusted the best I could. I finally went down to the gym and started working with the undulation rope, and then the softball pitching class came in....booted out again. So finally I just left the gym and went on to church, before I went in to sing I took advantage of the huge hills right beside the church and did some hill runs. I wasn't done working out yet and this for sure wore me out! I love my gym, I really do...but this is about to get on my nerves. Unless I want to do a free weight workout or a treadmill workout or go at 5am I cannot use the entire facility. And then there is the pool. Oh my gosh has this become a hot topic in my little town. Let me tell you about it. The high school has a swim team but no swimming pool and the city has a swim team but no swimming pool. There used to be a public city pool but it is damaged and broken to the point that it cannot be fixed and the city is not going to put another one in...not right now at least. That leaves the only other pool in the entire town the 2 lane therapeutic lap pool at my gym. Well guess what, now that there is not a public pool everyone wants to use ours. So now from August until February the High School swim team uses the pool and for the summer the city swim team uses the pool. Oh and for the summer there are swimming lessons, I forgot that part! They say you can use the pool while they are in there but there is absolutely no room in that tiny pool for anyone else to swim. This pool is just not big enough for a swim team, 8 rounds of swim lessons, water aerobics and all the others that just want to swim laps or walk. BTW, this is the picture that I was pretty sure was going to get me fired, then the plank pictures almost got me fired. I must be the biggest rule breaker! 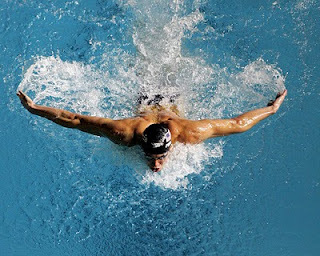 I am a fan of the swim team, I was on it as a kid and like the sport. But if there hadn't been a pool there probably wouldn't have been a swim team!!! This has been a huge discussion in our town for the past 3 months, people are yelling at the parks dept director and he cannot control the fact that the city wont put in a pool! People are barking out passive aggressive comments on Facebook, the list goes on and on. I would really like to swim at the gym without going at 5am. Sometimes I need an afternoon or nighttime swim to loosen up my sore muscles. But since I cant, I am waking up early in the morning to get my swim in. I will step down off my soap box now, and I will probably get hate mail now because I'm not on "hate the parks dept director!" and I am pro get the swim team out of my pool! There you go, its out there for the world to hear. I must get in bed now. My knee is cold, my eyes are droopy, and I have to be up so early to get in the water! Night all....set your alarms for an early one!